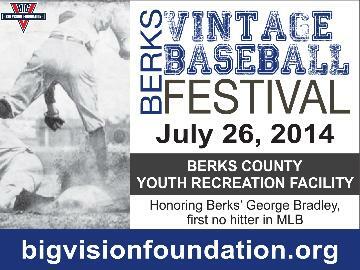 This event will feature Vintage Base Ball teams from 1860’s, 1870’s and 1880’s era's. Those attending will love seeing how the rules of the game have evolved during the last 40 years of the 19th Century. This festival will also celebrate the accomplishments of George Bradley, a native of Reading, PA, who threw the first no-hitter in MLB history on July 15, 1876 when his St. Louis Brown Stockings defeated the Hartford Dark Blues 2-0. *Eric Miklich, a nationally renowned 19th Century Base Ball Historian from Beth Page, New York will be on hand throughout the day giving hands on 19th Century Base Ball demonstrations. *Tom Melville, a nationally renowned 19th Century American Cricket Historian, will be on hand to give interactive Cricket demonstration so visitors can witness first hand the roots of American Base Ball. *The Ringgold Band will be performing from 1 pm to 4 pm. *Several vendors will be on hand displaying equipment of the time period. *We encourage guests attend in period era clothing. *Several vendors will be on hand displaying equipment of the time period.